Can the ways people search for volunteer opportunities give us insights for designing technologies that connect people with volunteer opportunities? Users rely on various technologies to find volunteer opportunities. Time requirements and scheduling concerns factor into users' interest in volunteer activities. Users volunteer for reasons unrelated to supporting a cause, such as learning a new skill or to build their experience for resumes. Users who find activities that align with their interests will commit to volunteering more frequently than users that volunteer for activities that they do not find interesting. Users that find organizations that present detailed opportunities via the internet are more likely to commit to activities than those who find organizations online that do not have details about the opportunities. Mostly due to the low sample size, we failed to reject the null of both hypotheses. For the first hypothesis, we wanted to be able to say that our data supports that individuals volunteer for motivations other than their interests, but there were neither strong positive or strong negative correlations between any of the six motivation factors. 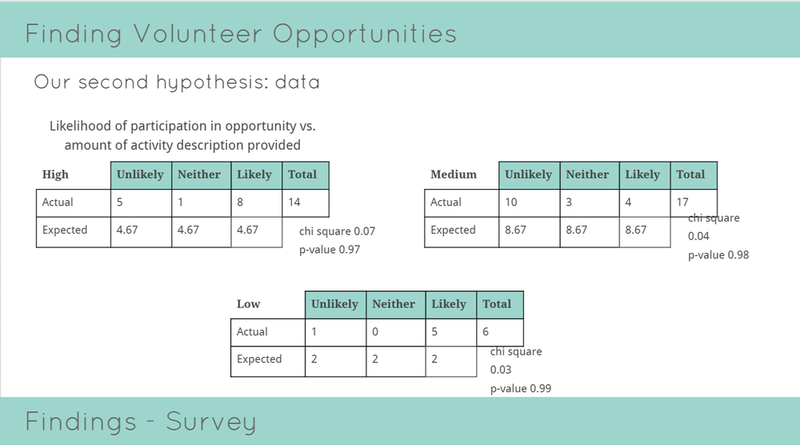 For the second hypothesis, our results showed that individuals who had received the most detailed opportunity description stated they were more likely to commit to the activity than those who had received the medium description. However, we believe that because this question was randomly distributed to our participants, the low sample size for each description lead to the results not being statistically significant. Our research suggests that designers placing opportunity details “up front” in the information architecture. Participants seemed drawn to opportunities that contained more detail. Also, designers should advertise other benefits of the volunteer opportunity. Most of our subjects were motivated by seeking a form of accomplishment with their volunteer work, so advertising potential achievements could raise interest. We learned that potential volunteers have a variety of different schedules, so we also recommend that organizations offer flexible hours for opportunities. Designers can also help by building schedules and calendars into sign-up interfaces and creating opportunity-detail pages. We recommend that organizations have a social media presence because our participants responded positively to the social influence of their friends and family. Our research results gave us a low turnout on the effectiveness of email based marketing; we only recommend this method as a quicker alternative to having a developed social media presence.